I would like some help to determine if a Lion Head slot that I just purchased is original. It has a 10 stop mechanism but it has the straight back bar like all the Mills machines from the 40s and 50s. The jackpot is different than any Mills jackpot that I have worked on. Based on these 3 pictures do you think that this could be an original Lion Head. dougev wrote: I would like some help to determine if a Lion Head slot that I just purchased is original. Yes it most likely is an original. That jackpot style was also used in the very early war eagles along with that 10 stop mech. Thank you Oldslotman and Montanaslots for you comments. 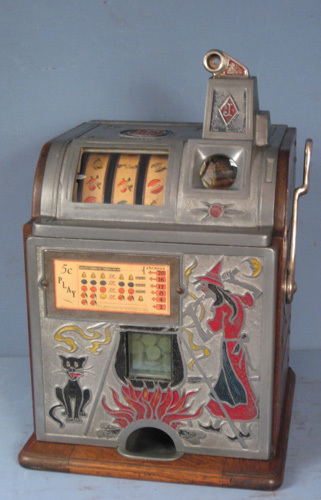 It is good to know that the jackpot is from the early 30s or late 20s and you both think it is probably an original. What bothers me is that in slots that I have had before from this vintage, they have had the offset back bar instead of the flat back bar that this one has. Also this one had the handle damper unit in the bottom where early slots that I have had did not have an air damper in the case. Would the above change your opinions?? No, I believe it is an original. It has definitely been altered from its original look. The Cherry clusters are common on Black Cherry machines. A Bursting Cherry is a different Mills machine with a large cherry cluster in the middle with sun rays around it. As you mentioned it appears it may have been a Diamond Front that they replaced the diamonds with Black Cherry clusters.